Abstract：To explore the daily activity rhythms of wild ungulates in response to the seasonal changes of living conditions and the predation risk in protected nature reserve, the daily activity of roe deer (Capreolus pygargus) was analyzed using camera trapping in Inner Mongolia Saihanwula National Nature Reserve from March to December 2013. A total of 693 times of C. pygargus were recognized within the obtained 3 439 valid pictures and videos. We found that (1) C. pygargus displayed activity traits with 2 peak intervals in the dawn (from 04:00 to 06:00) and dusk (from 17:00 to 19:00), respectively. In summer, both the 2 peaks were delayed, and this might be due to the high temperature and predatory stress. (2) The daily activity intensity had no seasonal differences, but the relative activity intensity in spring was the highest (49.64%) followed by that in winter (27.99%). The summer activity intensity (10.68%) was closed to that in autumn (11.69%). We postulated that the factors of temperature, predation risk, estrus state and food demand might play an important role. (3) C. pygargus showed high proportion of feeding, salt licking and vigilance behavior, and there was no difference between seasons. These findings may contribute to understanding the behavioral adaptation of wild C. pygargus and provide baseline information for effective management of ungulate in the reserve. 陈琛, 胡磊, 陈照娟, 等. 2017. 大兴安岭南段马鹿日活动节律的季节变化研究[J]. 北京林业大学学报, 39(4):55-62. 陈耕, 李艳香, 滕丽微, 等. 2014. 黑龙江凉水国家级自然保护区西伯利亚狍的冬季食性[J]. 经济动物学报, 18(2):91-95. 陈九屹, 张逦嘉, 王安梦, 等. 2011. 内蒙古赛罕乌拉自然保护区狼的数量分布和食物组成[J]. 动物学研究, 32(2):232-235. 陈龙, 李月辉, 胡远满, 等. 2017. 小兴安岭铁力林业局冬季西伯利亚狍(Capreolus pygargus)的生境选择[J]. 生物多样性, 25(4):401-408. 高立杰, 侯建华, 武明录, 等. 2013. 圈养条件下仔狍的行为节律研究[J]. 黑龙江畜牧兽医, (15):155-157. 葛志勇, 朱洪强, 毛之夏, 等. 2012. 黄泥河自然保护区狍冬季栖息地选择[J]. 生态学杂志, 31(4):943-948. 胡金元, 袁西安. 1986. 延安地区狍的生态观察[J]. 动物学杂志, (3):26-28. 胡亮. 2015. 基于红外相机技术的北山羊(Capra ibex)活动节律与集群行为的研究[D]. 石河子:石河子大学. 贾晓东, 刘雪华, 杨兴中, 等. 2014. 利用红外相机技术分析秦岭有蹄类动物活动节律的季节性差异[J]. 生物多样性, 22(6):737-745. 蒋志刚, 江建平, 王跃招, 等. 2016. 中国脊椎动物红色名录[J]. 生物多样性, 24(5):500-551. 李桂林, 张兴贵, 张书理. 2005. 赛罕乌拉自然保护区志[M]. 赤峰:内蒙古科学技术出版社. 李路云, 滕丽微, 刘振生, 等. 2014. 黑龙江三江国家级自然保护区西伯利亚狍冬季食性分析[J]. 经济动物学报, 18(1):29-32. 李明富, 李晟, 王大军, 等. 2011. 四川唐家河自然保护区扭角羚冬春季日活动模式研究[J]. 四川动物, 30(6):850-855. 李伟. 2003. 白石砬子地区狍生态习性观察与食性分析[J]. 辽宁林业科技, 2003(5):16-18. 李忠秋. 2016. 三种珍稀有蹄类动物的警戒行为数据[J]. 生物多样性, 24(12):1335-1340. 刘雪华, 武鹏峰, 何祥博, 等. 2018. 红外相机技术在物种监测中的应用及数据挖掘[J]. 生物多样性, 26(8):850-861. 龙帅, 周材权, 王维奎, 等. 2009. 矮岩羊夏季活动节律、时间分配和集群行为[J]. 动物学研究, 30(6):687-693. 尚玉昌. 2006. 动物的行为节律[J]. 生物学通报, 41(10):8-10. 汤小明, 张德怀, 马志红, 等. 2016. 北京雾灵山自然保护区冬春季地面活动鸟兽红外相机初步调查[J]. 动物学杂志, 51(5):751-760. 滕丽微, 刘振生, 张恩迪, 等. 2006. 黑龙江省三江自然保护区狍对冬季卧息地的选择[J]. 动物学研究, 27(4):86-88. 王力军, 洪美玲, 肖向红, 等. 2004. 应用骨髓脂肪指数评价狍冬季体状况[J]. 兽类学报, 24(4):353-356. 肖治术, 李欣海, 姜广顺. 2014. 红外相机技术在我国野生动物监测研究中的应用[J]. 生物多样性, 22(6):683-684. 张书理, 彭宝明, 巴特尔, 等. 2007. 赛罕乌拉自然保护区珍稀野生动物多样性及动态监测初探[J]. 内蒙古大学学报(自然科学版), 38(3):316-319. 朱洪强, 毛之夏, 左璐雅, 等. 2010. 吉林省狍的种群数量及动态研究[J]. 经济动物学报, 14(1):5-8. Beauchamp G. 2015. Animal vigilance:monitoring predators and competitors[M]. Oxford:Academic Press. Cameron EZ, Toit JTD. 2005. Social influences on vigilance behaviour in giraffes, Giraffa camelopardalis[J]. Animal Behaviour, 69(6):1337-1344. Childress MJ, Lung MA. 2003. Predation risk, gender and the group size effect:does elk vigilance depend upon thebehaviour of conspecifics?[J]. Animal Behaviour, 66(2):389-398. Li S, Mcshea WJ, Wang DJ, et al. 2010. 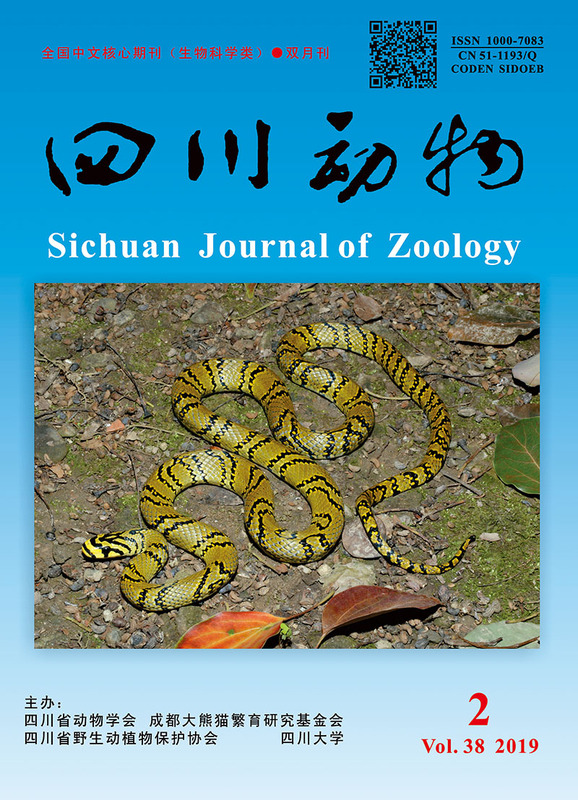 The use of infrared-triggered cameras for surveying phasianids in Sichuan province, China[J]. Ibis, 152(2):299-309. Lima SL, Bednekoff PA. 1999. Back to the basics of anti-predatory vigilance:can non-vigilant animals detect attack?[J]. Animal Behaviour, 58(3):537-543. Michelena P, Noël S, Gautrais J, et al. 2006. Sexual dimorphism, activity budget and synchrony in groups of sheep[J]. Oecologia, 148(1):170-180. Nowak RM. 1999. Walker's mammals of the world, 6th edition[M]. Baltimore:The Johns Hopkins University Press.